The Phoenician people were an ancient Semitic population, who inhabited much of modern day Lebanon, Israel, Jordan, Syria and Palestine between 1,500 and 300 BC., when the empire fell to Persian rule and was split in to four vassal kingdoms. Phoenician art is unique for its hybridity of foreign cultures, primarily Egyptian, Greek and Assyrian, as students, traders and soldiers ventured in to new lands before returning laden with exotic goods, techniques and tastes. Phoenician stone sarcophagi are a genre of Egyptian origin, not only in their inspiration but also in appearance and use. However at a certain moment between the 5th and 4th centuries B.C, Greek influence intervened and left the typology the same, but radically altered the iconography. Dating from this re-defining period, this fantastically preserved upper portion of a monumental anthropoid sarcophagus displays the beginnings of these new influences, such as the much-exaggerated round head, but predates the total abandonment of the old style, making it an important piece. This sarcophagus is striking in its powerful serenity, with huge, almond shaped eyes that stare in to the onlooker, and a large stylised face that has a neutral expression but exudes calmness in the presence of death and expectancy of the afterlife. The prominent nose, sharp brow, incised mouth and protruding ears are caricature like in their rendering, but exhibit a skill for, and love of symmetry. A simple tripartite wig with tapering lappets, which is greatly influenced by Egyptian fashion, arches in a crescent across the forehead, behind the ears and fall forward over the shoulders. Archaeology has been helpful in recreating Phoenician burial rites, for which textual resources are scant. Ritual lamentations such as the tearing of mourner’s hair, the beating of breasts and the wearing of sackcloth took place, and carbonized food remains and broken tableware suggest ritual banquets happened in the tomb, before libations were poured and incense was burned to inaugurate its closure. 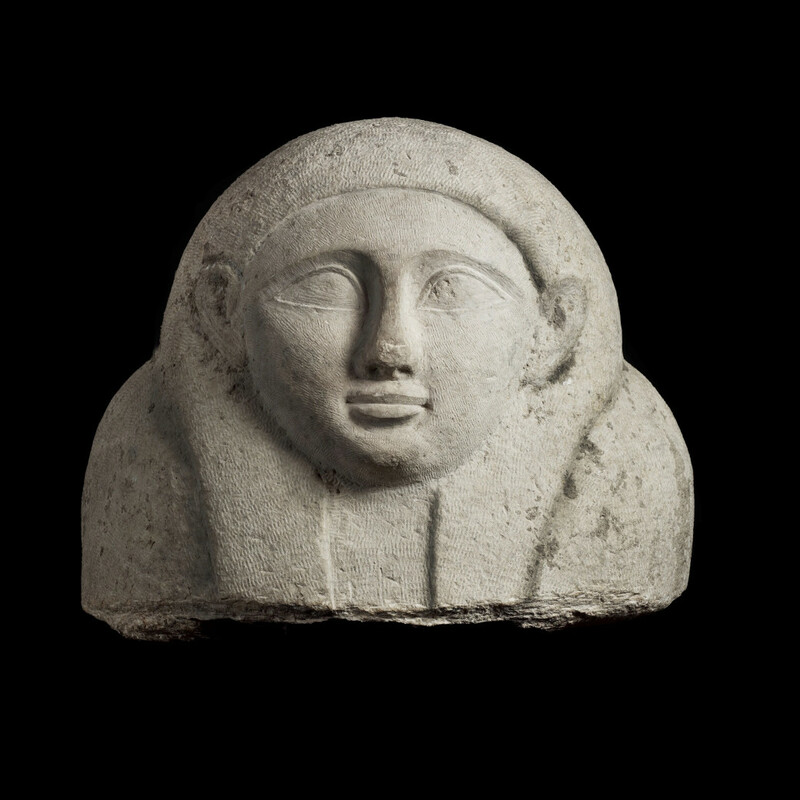 Perhaps all this would have unfolded around this stone lid some 2,500 years ago, with the mourners looking on to this face, representative of the deceased interred. The British Museum in London contains a Phoenician Sarcophagus from the 5th century B.C that is part of this same period when the sculpting is distinctly Egyptian in style, but on the cusp of Hellenising. Both Sarcophagi have distinct oval eyes, thick brows pinched to a point, and typically Egyptian style incised hair tucked behind their ears. The smooth, undecorated surface, tall slender body and tightening of the facial features of both examples hint at the impeding transformation in artistic tastes; Hellenistic realism and drama is beginning to take over from the Egyptian preference for abstraction of form, symmetry and calmness. The complete nature of the British Museum example suggests how this lid would have once fitted within its complete monumental arrangement. S. Moscati; The Phoenicians, I.B. Tauris, 2001, p.355. G. Markoe; Phoenicians, University of California Press, 2000, p.138. Anthropoid white marble coffin lid of Sidonian type, with male in Egyptian style head dress, with two hand grips by shoulders. British Museum, London. Phoenician, 5th century BC., L: 228.6 cm., W; 81.28 cm., H: 40.64 cm., 1864.1128.1. Sotheby's, New York. 8th June 1984.